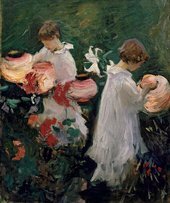 In August 1885 John Singer Sargent was on a boating trip with fellow American artist Edwin Austin Abbey when he glimpsed an enchanting scene in a garden at Pangbourne on the banks of the Thames: children lighting lanterns hung among trees, lilies and rose bushes. He described it to Robert Louis Stevenson as ‘a most paradisaic sight’, and it became the inspiration for what he came to call his ‘big picture’. 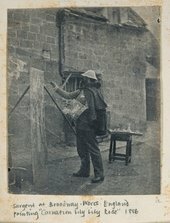 During the trip, Sargent injured his head in an accident and Abbey took him to Broadway in the Cotswolds, where the American painter Frank Millet and his wife Lily were living, so that he might convalesce. Broadway was a pastoral idyll, and the Millets were a hospitable and gregarious couple who operated as a kind of artistic magnet, attracting a group of painters, writers and musicians around them, so that the village became, for a time, something of an artist’s colony. Here, Sargent began to make studies for the picture in the garden of the Millets’ rented house, Farnham House, on the green in Broadway. His first model was their five-year-old daughter Kate, but she was replaced by Dorothy (‘Dolly’) and Marion (‘Polly’), daughters of the illustrator Frederick Barnard, who were older and whose fair hair was better suited to the aesthetic of the painting. White dresses were made for them by Mrs Barnard and her sister in the smock-like style of Kate Greenaway’s illustrations. Early in November Sargent returned to London, leaving the unfinished picture in store in Broadway. At about this time, the novelist Henry James, who had visited Farnham House, described the picture as ‘a splendid idea, but he will have to wait to next summer to do anything successful with it. It is now only a powerful auguring’. By the following year, the Millets had moved to Russell House, a few hundred yards down the road. 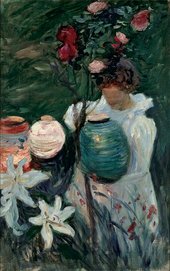 Sargent was determined to be prepared for this second painting campaign, sending 50 Aurelian lily bulbs for Lucia Millet, Frank’s sister, to plant in garden pots. He set himself the challenge of representing fugitive evening light, the artificial glow of the lanterns and the light reflected on the children’s faces, the whites of their dresses and the lilies. Sargent wrote to his sister: ‘Impossible colours of flowers and lamps, and brightest green lawn background. Paints are not bright enough and then the effect only lasts 10 minutes.’ But he approximated the subtle effects using orange for the glow of the lanterns, peachy reflections for the skin tones, white, mauve and pinks for highlights in the dresses and dusky greens for the shadows. Two pencil drawings of the heads of Dorothy and Polly were probably presentation sketches done after the oil painting, rather than preliminary studies. Sargent gave these to his models, and Dorothy Barnard bequeathed them to Tate in 1949. Elaine Kilmurray is Research Director of the Sargent catalogue raisonné and co-author (with Richard Ormond) of the nine volumes of the published catalogue raisonné (Yale University Press).